Mine operators are now increasingly calling for machines that are mobile, highly manoeuvrable, and capable of undertaking a wide range of roadway and tunnel drivage and reconstruction works. When choosing a particular machine type, its degree of mechanisation has to be weighed up against the multipurpose nature of the deployment, which will then depend on the type of application and operating environment. While a “simple” all-hydraulic control system will not feature all the available sensor technology, and will have certain limitations when it comes to the automation of individual procedures, when compared to an all-automatic machine, it will be more robust under certain operating conditions, will require less maintenance effort, and will entail lower procurement costs. Many manufacturers in India can supply crawler-mounted base vehicles in a number of weight categories, which can be equipped with different drive units, and can be supplied with or without quick-release attachments. 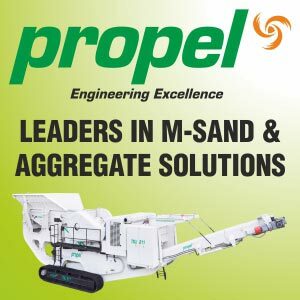 The range of ancillary equipment available includes working platforms, drill feed, side-tipping shovels, and activated dinting shovels and special solutions such as cutting heads with air-water external spray systems and special shovels for laying curb stones. Excavating small roadway and tunnel profiles using drilling and blasting methods, traditionally required manoeuvring hitches to be provided in the side-walls for materials transport, and to allow the different vehicles and items of equipment to pass each other, or be parked-ready for operation, as each process in the road heading cycle generally calls for a different machine with its own running gear. This means providing a large fleet of vehicles, resulting in high procurement and operating costs. Manoeuvring the individual machines into place takes time and further delays the sequence of operations. Multifunction machines like the HBL 800 drill-loader (Fig1) have the potential to increase the rate of advance in that the main operations in the road heading cycle, namely drilling and loading, are combined in one carrier vehicle. This multipurpose machine is designed to operate on its own at the heading face. A drill feed attachment is fitted for shot hole drilling and roof bolting work (Fig 1), this being replaced by a side-tipping shovel (Figure 2) for the loading cycle. There is also the option of connecting a shot-crete manipulator. The installation is designed to operate in arch-profile tunnels with cross sections of 10 m2 and over. A two-to-one turnout and a preassembled section of track are also integrated into the system to serve as a floor-rail transport route. Other available attachments include telescopic drill feeds, a range of dinting shovels, hydraulic hammer drills, and various specialised tools for carrying out tunnel stabilisation work. The HBL 800 drill-loader is equipped with electro-hydraulic drive and is operated from a driver’s cab with an overhead canopy to protect against falling stone. Using the machine as a stand-alone multifunction system for road head operations places higher stresses on the base vehicle when it comes to handling and servicing. However, procurement and operating costs are lower than for conventional machine systems, which comprise a drill jumbo and loader, as only the basic machine has to be purchased and serviced. Any maintenance work needed can be carried out during non-operating periods, e. g. when the shot holes are being prepared. More extensive repairs are undertaken during the maintenance shifts, if need be. In its standard version, the machine features a fairly simple sensor system that most users prefer because of its ease of operation. However, there are essentially no limits to the control technology that can be fitted if the customer wishes. The increased efficiency of this HBL drill-loader machine compared with conventional technology is reflected in a higher rate of advance, provided that the road head zone is properly organised. The scheduled movement of heading debris and materials has to be adapted to the operations of the road heading machine. There is no waiting for machine change-overs and long travelling-in times, and the number of passing places and machine refuges is reduced as a result. Tool change-over is fairly quick and easy as the attachments are coupled up to the machine with the aid of a hydraulic quick-change device. The control and supply lines are connected using individually marked quick-release couplings. The various machine attachments are incorporated into the turn-round circuit in order to further reduce the change-over times. When used in combination with continuous conveyors for debris clearance, the machine attachments can be held ready in mobile rigs or slung from chains close to the road head. The HBL 800 drill-loader’s manoeuvrability, gradient capacity of ± 18 ° and electric drive also make it a suitable option for the tunnel construction industry, e. g. for excavating head race tunnels. The advantages of the HBL 800 drill-loader combination led to considerations as to whether efficiency could be further improved by placing all the road heading components on one base machine, this comprising the tools required for drilling, blasting preparation works, loading, clearing out and support setting (Figure 3). Such a development would scale down the size of the vehicle fleet, cut tool change-over times and reduce the number of passing bays and refuges needed for the machines (Figure 4). Active loading apron at the front of the machine that operates in conjunction with a cantilever boom that has been specially designed for mining and tunnelling applications. The boom drags or tips the road heading debris on to the apron, depending on the type of bucket fitted, and loader bars then push the material towards a central chain scraper conveyor operating along the length of the machine. The tool attachments, which are parked on a sliding track, can be rapidly changed over, thanks to a mechanical quick-release unit. The boom unit features both vertical and horizontal parallel kinematics. As well as fitting scoops and drill feeds the hydraulic quick-release unit can also be used to attach a range of other accessories such as working platforms, hydraulic breakers and rotary tools. The drill feed and shotcrete manipulator are mounted on offset slides positioned to the right and left of the conveyor. The tools are picked up by the boom, when required, in response to commands from a remote control system. The HRE, along with its main operating tools and structural elements, has been designed and equipped for mining and tunnelling applications. The essential features of the machine have patents pending. The HRE can attain the unlimited drilling capacity of a conventional jumbo, thanks to the dimensional design of its driveline set-up, the potential power category of the hammer drill, the boom kinematics and the degree of freedom available to the drill feed. The main technical data for the HRE are presented in Table 1. The introduction of the HRE has reduced machine costs and personnel costs; cut to minimum time-consuming and cost-intensive work of preparing machine bays and refuges; and delivered an overall reduction in energy consumption. The machine’s electric drive system has also significantly reduced the expenditure on providing underground ventilation. Opting for the HRE as a system solution for drill and blast drivage operations in small-profile roadways is likely to result in higher rates of advance and lower operating costs when compared with conventional equipment combinations. The machine’s effectiveness has been demonstrated in a study undertaken by RWTH Aachen University using the Discrete Event Simulation method (Figures 5 and 6). This project, which was based on the case of a roadway 3,000-m in length and with a cross section of 10 m2, sought to draw a comparison between the conventional system of LHD, drill jumbo and shotcrete manipulator, the combined arrangement of crawler-mounted road-heading excavator (RHE), jumbo and shotcrete manipulator, and the new HRE machine, each of the three systems operating with a maximum of three dump trucks. The average cycle times depicted in Figure 5, include both the change-overs for each operating sequence and the additional work associated with the excavation of the machine change-over bays.